It all started so well. Dave and I had entered SITS in the pairs category – it’s pretty safe to say that neither of us would entertain the idea of riding solo at Catton ever again but having a rest after every fast lap seemed like an idea compromise. If our previous antics in the world of 24 hour pairs racing was any kind of benchmark, we should do pretty well. 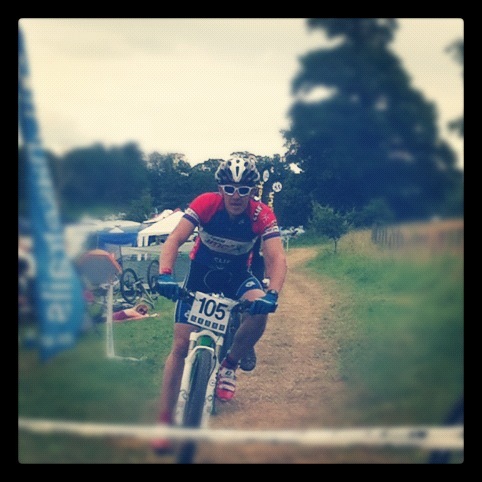 The race started with Dave charging through the run and finishing his first lap in around 4th position. He came tearing into the changeover with a large grin on his face, gleefully proclaiming that the course was “nice and fast”. Ace. Here we go. He was right. Carving around corners, swooping along tree-lined narrow singletrack, stomping up the short climbs, big-ringing the fireroad sections, I returned to hand over to Dave absolutely buzzing. I was probably going a little bit too fast and putting a bit too much effort in for my own good, but this was brilliant fun and I was more than prepared to bury myself for 40 minutes, have a nice cup of tea and a sit down and then repeat. Another changeover. Another lap. Faster, smoother this time, the various bends and nuances of the course being logged and committed to memory, less effort needed to get around the lap in the same amount of time. We were in the lead and after just three laps we’d gained a 5 minute gap. We were hammering this race. Wind was picking up. Ignore it. It’s going to stay dry. Dave came back in, still grinning. I set off on another lap. Faster still. This was starting to pan out like Gisburn. Maybe we should race in the pairs more often. A wasp flew into my half-unzipped jersey and stung me twice on the shoulder. Had a bit of an arm-waving fit but kept riding. Handed over to Dave, got back to the tent for a cuppa and a sit down…….and it started to rain. Hard. In hushed tones (and emails) before the race, we’d pretty much decided that if it rained, the beer would come out and we’d sack it off. That sounds like a terrible way to approach a race in which we had a sponsored entry, but having had the Damp Catton Park Experience many times in years gone by we both knew that once it’s rained it’s always a thoroughly unpleasant experience. While it rains it’s super-slippery and once it’s stopped raining, the trails become claggy and sticky. It’s not racing, it’s spirit-sapping, abject misery. Dave came back to the changeover. Peering over mud-splattered and misted-up glasses, the grin had gone. Grimly, I set off on my lap. The rain started to hammer down. The course was starting to become waterlogged and I was soon coated in wet mud. Walked a couple of off-camber sections but on the whole, the lap wasn’t too bad. The race was effectively over from that point on though. Now the event was a test of who was prepared to tough it out and who would be prepared to spend the next 18 hours or so dragging a mud-encrusted bike around the course. Not us. Life’s too short. We’d already decided that if we packed up and went home now, we’d each be able to have a good night’s sleep at home and then have all day on Sunday to do something more rewarding. Such as RIDING a bike. Or not being grumpy. Dave rode one more lap, we handed over and I rode about 200 yards of a lap before climbing over the fence back into the campsite – the sight of other riders either walking with their bikes or sliding down the first hill on their backsides just brought back all the memories of SITS past. Despite both having a full compliment of mud tyres and even narrow cyclocross tyres, neither of us were in any hurry to fit them to the bikes and crack on with the misery. Not again. Time to go home. Sounds about right. It’s reassuring to hear “better things to do than that rubbish” from people who actually win stuff!